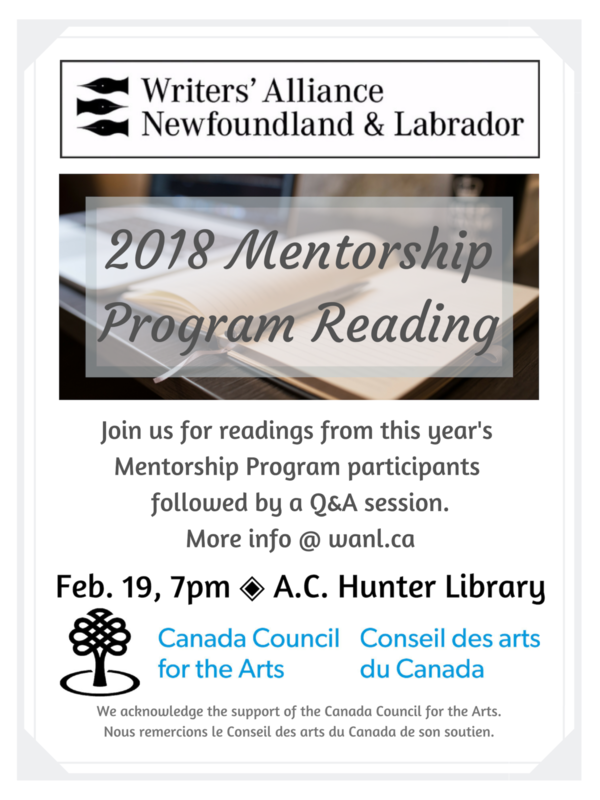 The WANL Emerging Writers Mentorship program is designed to serve the needs of emerging Newfoundland and Labrador writers who are committed to the development of their writing. It is aimed at writers who are on the cusp of professional publication and who have a substantial work-in-progress. Emphasis is on producing a work ready for the marketplace. Apprentices are matched with senior writers, with whom they work on a one-to-one basis over an intensive five-month period. Have you been considering applying to the Emerging Writers Mentorship program? This is a great opportunity to see if it’s right for you, and to get your questions answered. Host Terry Doyle is a writer from the Goulds, Newfoundland and was a participant in last years Mentorship Program. Terry was winner of the 2017 Percy Janes First Novel Award, and finalist for the 2017 NLCU Fresh Fish Award, his work has appeared in Riddle Fence, Papermill Press, and the Newfoundland Quarterly. His debut short story collection, DIG, is due April 1st from Breakwater Books. This program is made possible by the generous support from the Canada Council for the Arts.